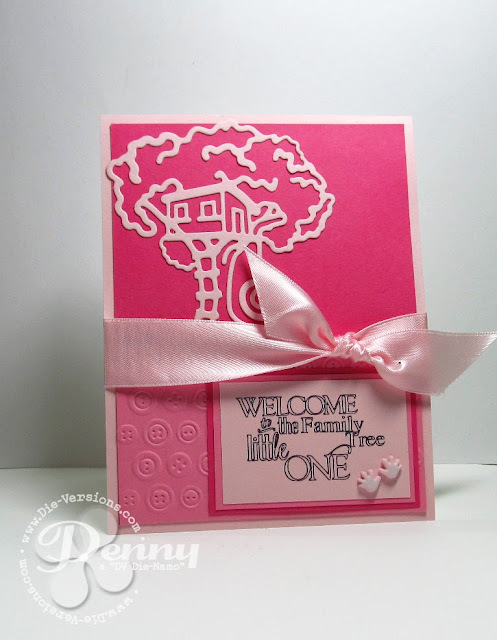 Hi friends....no little girls at my house as I have two sons and two grandsons, but I have to tell you I had a blast making this baby girl card with the new Tree Dream die from Die-Versions. However...Melissa at CASology just had a baby girl and her Design Team asked us to send cards for a Virtual Baby Shower...how cool is that?!? We have come a long way baby! It is not exactly a CAS card...but I don't think she will mind. Sentiment is from the Silhouette Store with a little manipulation so I could get the word "tree" in there. This card is also entered into the Wednesday Challenge at Simon Says Stamp. What a cute idea for welcoming a new baby! Loved it. That tree die is amazing. It really pops off of the dark pink background. I have all boys too, I'm looking forward to getting a PINK card made :) Melissa will just adore this! How cute is that tree house die! Eeek! Thank you so much for joining us at Melissa's Baby Shower! How cute and clever! I would never have thought of using this die as a baby card. I'm with Anne - take a tree and make a baby card?! But now it seems obvious! Perfectly sweet! Thanks for coming to Bryna's baby shower! Love your sweet pink confection, Penny! Until recently, I was surrounded by males but finally we have a granddaughter! Thanks for sharing your card with us at the Simon Wednesday Challenge!